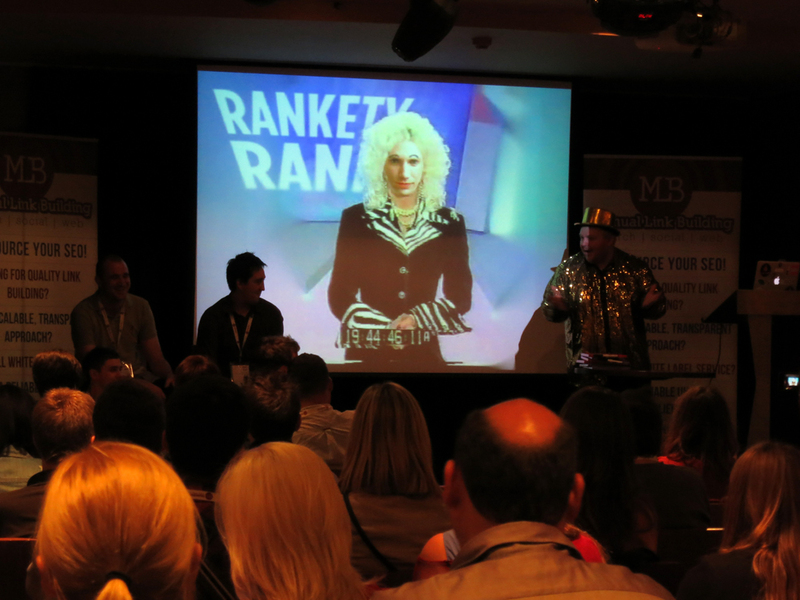 #ThinkVis, #SinkVis, #DrinkVis, … whatever your preferred hashtag – this weekend a whole lot of online marketing rockstar, ninja, guru types headed once again to the Alea Casino in Leeds for the Think Visibility 2012 Autumn Edition. 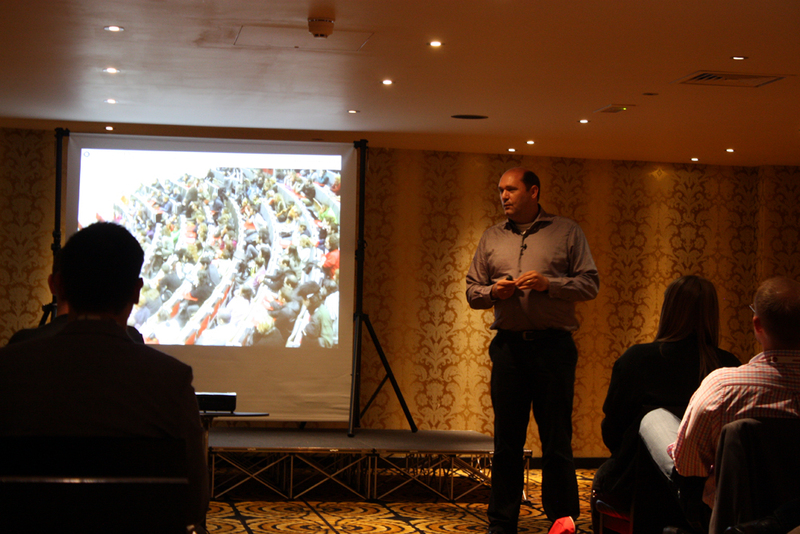 As always a selection of high quality speakers (including our very own Bas van den Beld) shared their knowledge on a variety of topics from the world of affiliates, PR, Market Research, SEO, Link Building and more! Host with the most Dom Hodgson provided the lunchtime quiz show entertainment, this time in the form of Rankety Rank with sponsors Manual Link Building dressed in cardboard costumes (including Rhys Wynne as a squirrel). As usual he then filled our brains with his wackiest online venture yet. Using crowd Sourcing and gamification, Dom intends to fund his upcoming wedding with his unique spin on reality TV show ‘Don’t tell the Bride’ – ‘Don’t Tweet the Bride‘. Give the man a fiver to get access to unique content as wedding plans progress, but if you’re feeling generous for £15,000 you can choose the middle name of the happy couples first born ‘within reason’. So without further ado – my round up. 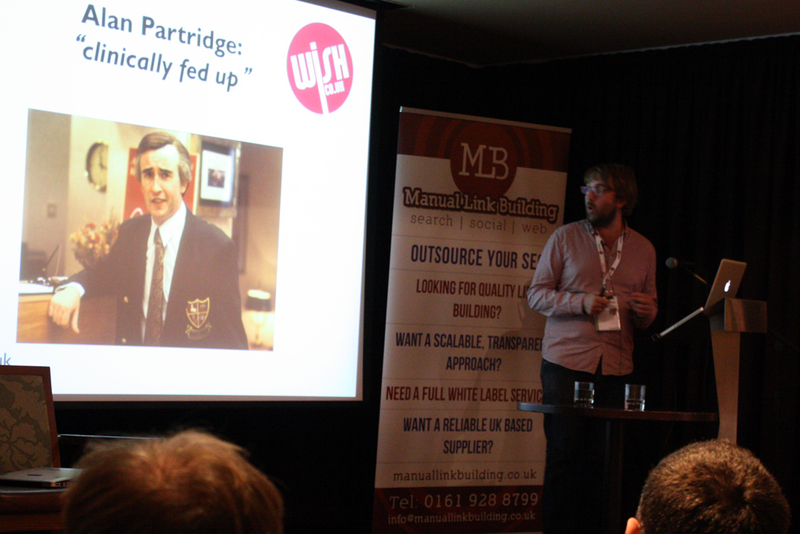 I didn’t attend every talk, but I have sourced as many slides as I can from other sessions for those who missed it. A fascinating and entertaining look at messages that ‘they’ are giving us and our kids every day to make us want stuff and make us buy it – lots of it! Great insights into timing, triggers, and being there when people are at their most receptive. Bas always brings in amusing examples to make the point, from the village in Switzerland printing out the facebook likers to an example of the dutch supermarket playing ‘kiddie’ songs that parents tune out but with the lyrics suggesting that you can ‘Buy this fun stuff- go tell your dad’. Psychological Triggers – using the example of a screen with the word YAWN on it – the fact that you may now be thinking of it is an illustration of powerful psychological triggers. Childhood memories, being there when times are fun are all part of lifestyle triggers to shift or associate products. 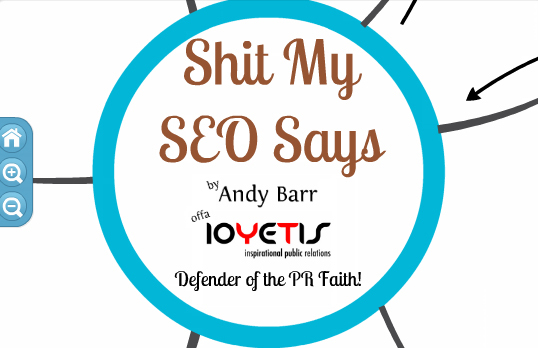 Andy Barr – ‘Defender of the PR Faith’ fed up with always taking a kicking for PR’s not understanding SEO, Andy turns it back towards SEO’s and he has a point! Design, LifeStyle, Fashion, Culture – what is going to be the next big thing or ‘must have’ first world accessory? That’s where the coolhunters come in to make predictions about current and potential future trends. Steve Lock takes an interesting look at Coolhunting and how it is being used to predict box office takings, game stock markets, influence product development and/or anything that has a market. A quality opening to a quality ThinkVis session. Richard Kershaw from wish.co.uk takes us on his journey from being an affiliate to taking the plunge and becoming a merchant. 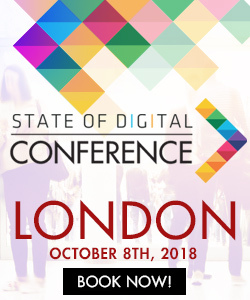 Being an ex ‘dirty affiliate’ myself, this was one of my favourite talks of the day and packed full of info that might encourage everyone to hang up their affiliate shoes and tackle the world of ‘Spa Days’ and ‘e-vouchers’ for themselves. Richard set up wish.co.uk with colleague Stephen Pavlovich in 2011 to provide unusual experience gifts including the now legendary Zombie Shopping Mall, Zombie boot camps. the controversial weekend away for 3, and more recently the terrifying Werewolf Experience. With endorsements from Zombie lovers like Simon Pegg and Jamie Oliver, you know that this affiliate to merchant venture is already a great success. 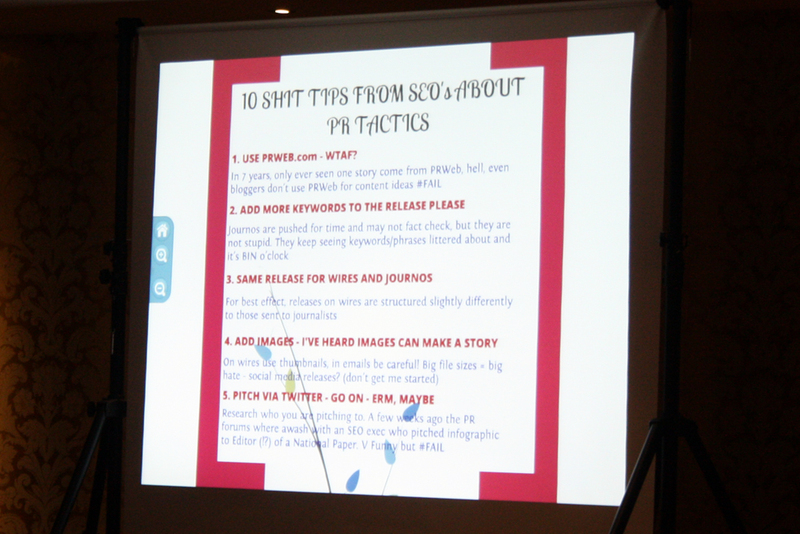 PR works – PR is often the start of linkbait for SEO (see above session from 10 Yetis) – Google organic traffic is not the biggest referrer- mostly it is people searching for the brand or products that have had PR coverage. 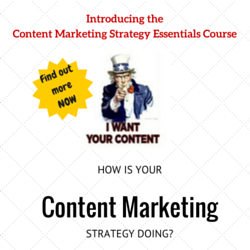 PR content also does extremely well for social media. I missed the event, but now, reviewing the slides, doesn’t Hannah Smith’s slide n.4 makes fun exactly on Simon Penson’s slide n. 14?